So you have a business website and you want it to drive more sales of your products and services. There's only one problem, it's not working well. What do you do? That's where conversion rate optimization (CRO) comes in. It's the process that you can use to take your website pages which may not be converting well, and transform them into customer creating assets. It's one of the quickest ways to create growth in your business. In this article, we are going to see how CRO works and how you can use it on your website. Conversion rate optimization is simply the practice of using a scientific approach on improving how your website converts visitors into paying customers. That is to say, that it's the exercise of coming up with a theory of why visitors are not taking the action that you want them to take, making changes to the website page that you think will work better, testing how visitors respond to those changes, and then making conclusions on the results. When you do this exercise several times in a row, you usually end up with a website page that performs much better than it did before in converting visitors. There are several different variables that you need to be aware of when it comes to CRO. If you don't handle these variables correctly, it can hurt your overall performance after you have completed optimizations. When we say sample size, we simply mean how many people visited the website after you made changes. If the number is too small, then the results are going to be skewed and can lead you to make the wrong conclusions about what is really going on. That means you may make things worse, rather than better. If that happens, then when many more visitors come to the website, their behavior will likely be different than what you thought would happen based on the small number of visitors. Usually, you can use statistics to ensure that you have enough samples. However, I have found that if you can get 1,000 visitors, you usually are looking at a good sample size on average. If you want to math nerd out, you can learn more about statistical testing and check out a handy calculator here. If you need more visitors to your website, then one of the best ways is with SEO. Check out my local SEO guide to find out how to implement it in your business. Another factor to be aware of is the device type that your visitor is using. For example, people are using their mobile devices to browse the internet much more frequently these days, and it's passed over to be more than 50% of devices. On sites that use WordPress, typically many of these websites have a sidebar, which on a mobile device gets moved down to the bottom of the main content. 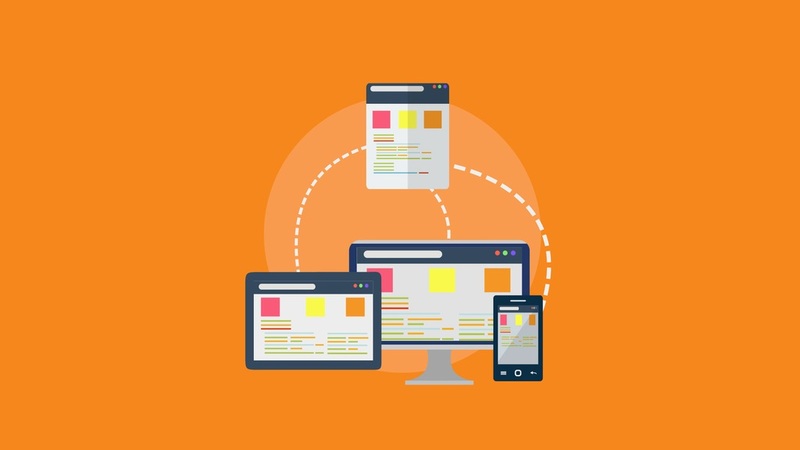 This will change the way the visitor sees your website when using a desktop computer versus a mobile device. The best way to contend with this is to make sure and run two different tests with your tools, which we will cover later. That way you treat these two main devices differently and any changes are accounted for and won't affect results on one device without your knowledge. Visitors' behaviors can change with the time of day, day of the week, and even during seasonal periods. Depending on the content of your website, you should be aware of these sensitivities and plan your tests accordingly. Typically, you should run a test for a full week so that you get all days, and all hours of each day captured. That way you don't end up with any pockets of behavior that don't represent the real whole set of behavior. This is the meat of the testing being done. It includes the content on your website page, images, buttons, any other call to actions, etc. 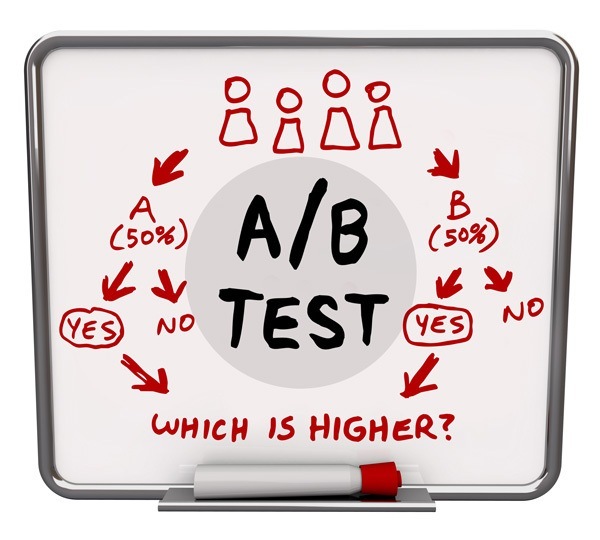 The goal is to conduct what is called A/B split testing, which is where you present different variations to visitors and see how they respond to each variation. Then, when your test is complete, you can compare the performance of these variations to each other to see which one performs better. Many people think that CRO is simply tweaking small things like button color and text. While this is important, there is much more to it than just that. For example, which of the buttons below looks more enticing to users as a call to action? Notice the differences in color, size, font, text, and icons in the button. You could split test each of these against each other, at separate times of course, and see which one gets clicked more. You should also pay attention to how far down the website page visitors are scrolling, and what is grabbing their attention. The most valuable part of your pages are what is called "above the fold", which is what gets loaded on their screen without them having to scroll down. You should have your most potent call to actions above the fold, since the further down the page you go, the less likely visitors will see it, since many start dropping out as you go down the page. Another important thing to test is your actual copy. The text that you use has a lot of potential of boring people all the way to driving them to want to buy right now. That's why you need to take your sales copy seriously and test different versions against each other to see which one performs better and why. Just remember to review the variables section above to make sure that you don't fall into any problems that can misguide your conclusions about the data. I'm personally a fan of Crazy Egg, and have used it for years. Let's take a look at the different types of tools available next and how you can use them to get results on your website. 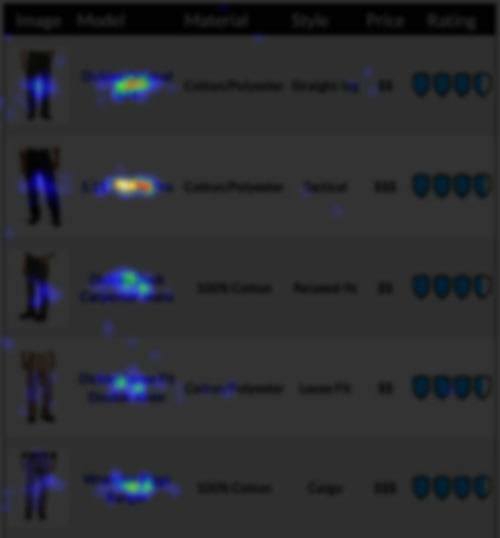 Heat maps effectively collect the number of clicks that visitors do on your pages and then presents them into a sort of "Predator vision" (if you remember the movies), which are just like a thermal imaging map. There is usually a legend, which is a color scale, that shows you what the colors mean in terms of numbers of clicks. The hotter the spot, the more clicks there are at that spot. 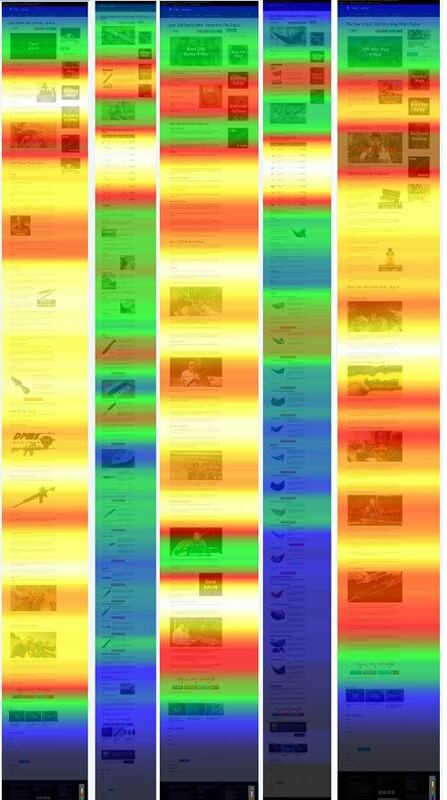 Heat maps are a great way to visualize what elements are getting the most attention on your pages, so that you can determine if that is what you want to happen, and if not, make it better. Scroll maps are critical in figuring out what people are doing on your page by showing you how far they are scrolling. You can see if people are getting bored, offended, or even lost and at what point on the page these things are happening. Then you can determine if you need to change what is on the page at those key points to keep your visitors interested in consuming more content, and therefore scrolling further down the page. Recordings have gotten popular, which is the ability to actually see what a visitor does on your page as if you were looking over their shoulder. It's very powerful if your heat map or scroll map data is confusing and you need to zoom in on a specific visitor to try to understand what is going wrong. However, be careful not to make any conclusions by just watching a few recordings. It needs to align with the other data that you have available. If you make changes on just a few recordings, it's like changing your hair just because one person said they didn't like it. What does the crowd think instead? A service that I really like is Photo Feeler. If you can leave your ego at the door, you can split test photos of yourself (or others) to see how people are responding to them, independent of your website. For example, all of the images that I have on this website of myself were the winners of a lot of split testing using this service. Ironically, the pictures that I chose of myself in the beginning, and that I thought were the best, tested the worst with split testing. Oops. After swallowing my pride, I got a much better insight into how others see me, without knowing anything about me. Then I was able to use much better images that others like the best so that I can present the best initial impression of myself. It's a game changing service. We took a big picture view at what conversion rate optimization is all about. Using this theory combined with the right tools, you have a lot of power at your disposal. If you look at the numbers, over 50% of websites are converting at less than a 2.35% rate, which is pretty bad. The top 25% of sites convert at over 5%. That means that you may be looking a 2x improvement for your website, depending on how well it's already doing. The top 10% of websites convert at over 10%. Where does yours currently perform? There's only one way to find out, it's CRO. If you need some help optimizing your website, I'd be glad to lend a hand. All you have to do is click on a button below to book an appointment or give me a call, and I'll walk you through the rest.